Last Friday I posted about the start of a full moon on January 1st. I forecasted a price move up based solely on the full moon appearance near a market low. Gann stressed that full moons that appear near market lows have a strong probability of showing bullish momentum. This has so far played out not just on Bitcoin, but for Litecoin and Ethereum. I want to show you three charts with 3 quick forms of analysis. This will be the basis for our trade analysis this week. If you look back at Friday’s analysis (and I hope you do), you will see that this is playing nearly exactly how we wanted it to. 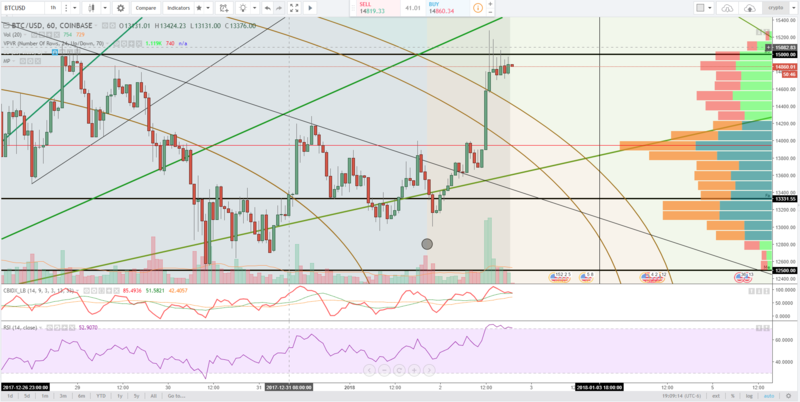 We have are above the short-term trend line, a break and hold above the 1×2 angle (lower green diagnoal), a break outside of the resistance arc (the brown curved lines) and we are now right below the 15000 handle. All signs point to higher prices. 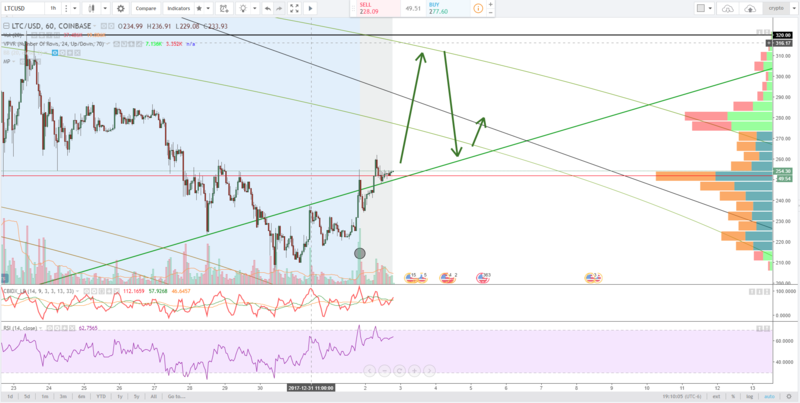 I have not really (maybe ever) posted an analysis of Litecoin. It has lost interest and participation over the last couple months. The only strong participation is seems to have had was during the Bitcoin crash in December, Litecoin just followed suit. However, Litecoin has done something very, very different for its behavior. It is acting as the leader of the 3 majors (I consider Bitcoin, Litecoin, and Ethereum to be the ‘majors’ from Coinbase). Expect to see price follow a similar structure to the arrows. A break above 320 is extremely bullish. In fact, we can expect Litecoin to just blast through some levels above and reach all-time highs very soon. Speaking of all-time highs, Ethereum has made new all-time highs. What is fascinating about this move is the total abdication of the bears on this coin. We have had one attempt to push this coin lower and it was handily bought up. Look at where price is at. It is above and moving beyond the final resistance arc (the thin blue arc). Not only that, but we are more than likely going to re-enter the 45-degree angle! This kind of movement and momentum is extremely bullish. Again, looks at these charts and see for yourself how powerful the moon phases are on even a short-term trend and time frame like today. It will be interesting to see how the next two weeks pan out. 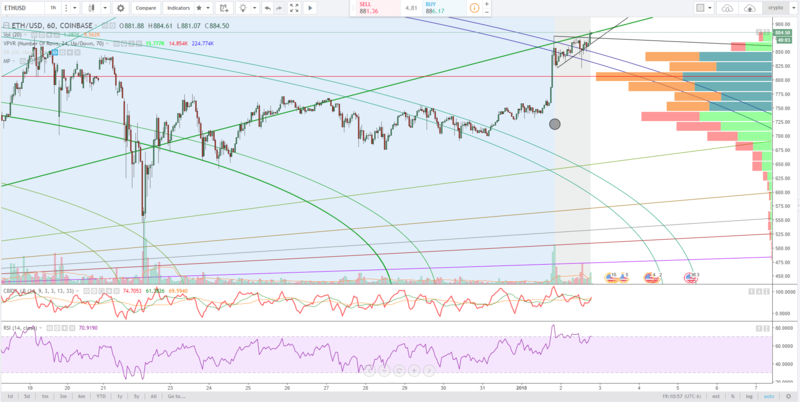 Can we expect some pull back from these levels? You bet! In fact, I am looking and desiring some pullbacks from these moves today. The price action today is going to be a great heads up for what the week has in store.